Ever since the 2019 Triumph Speed Twin was announced in early December, we’ve been excited about the prospects that it posed. The idea of Thruxton power wrapped in a more relaxed package intrigued us, and now, the moment is at hand. 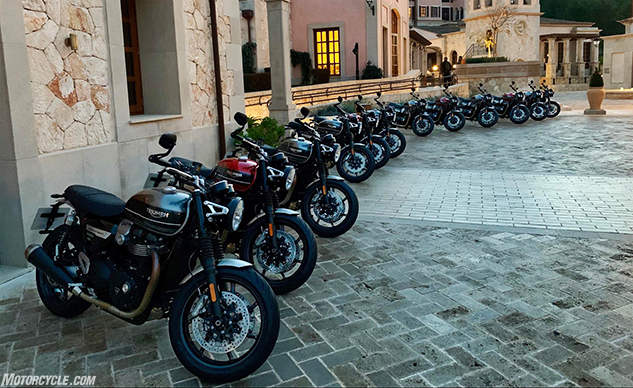 Thanks to the magical tubes of the internet, we have the skinny on the Speed Twin just hours after the press briefing at the riding launch in Mallorca, Spain. We’ll have a full first-ride review of the Speed Twin later this week. Until then, here are five facts you know about the 2019 Triumph Speed Twin. 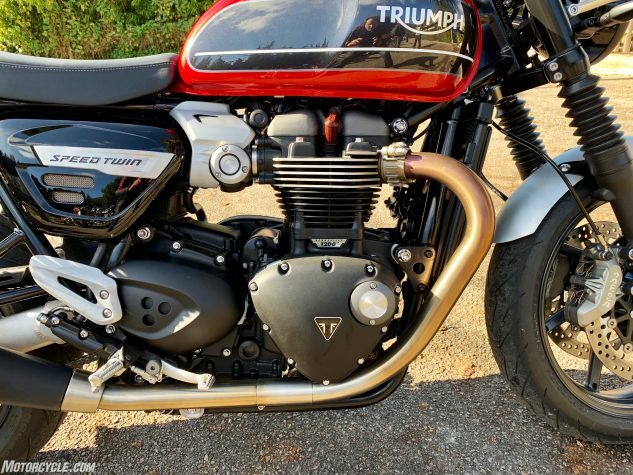 Well, we knew the Speed Twin was based on the Thruxton from the original announcement, but what we didn’t know was how much was changed. First, the engine is the high-power version of the 1200cc 8-valve parallel-Twin and is in a similar state of tune. Naturally, the EFI mapping will be slightly updated to account for changes to the exhaust system’s crossover. 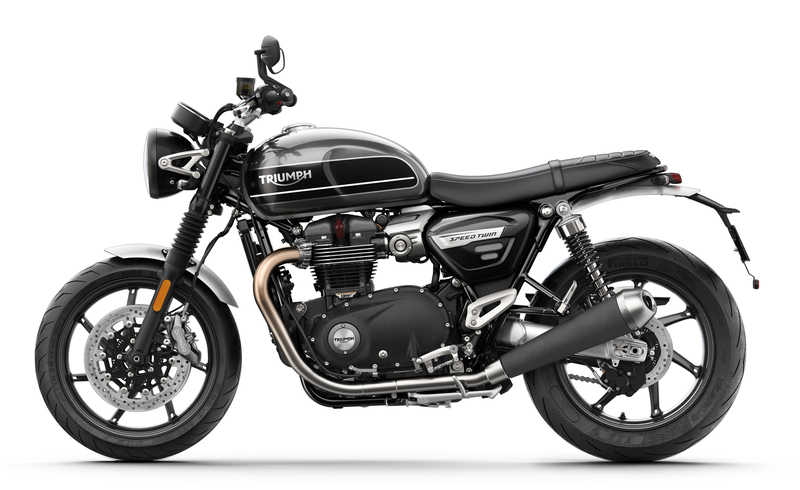 Although the frame is all new, its dimensions only changed slightly compared to the Thruxton. The rake is increased 0.1 degrees to 22.8, and the trail becomes 3.7 inches (an increase of 0.1 inch). The wheelbase also lengthens to 56.3 in (from 55.7) through the use of an additional link in the chain combined with the Thruxton’s swingarm. Changes to the rear subframe to accommodate the seat and rear fender are the primary reason for the new frame. The Speed Twin weighs in 22 pounds less than the Thruxton. Part of this comes from the aluminum cradle supporting the engine in the new frame. As we’ve previously noted, the engine is 5.5 pounds lighter thanks to the magnesium cam and engine covers. The front wheel and disc assembly is also 6.4 pounds lighter, while the rear wheel lost 3.7 pounds. We should feel this reduced poundage in every aspect of the Speed Twin’s performance. Triumph also reduced the weight of engine internals, like the clutch, in order to lessen the rotating inertia. 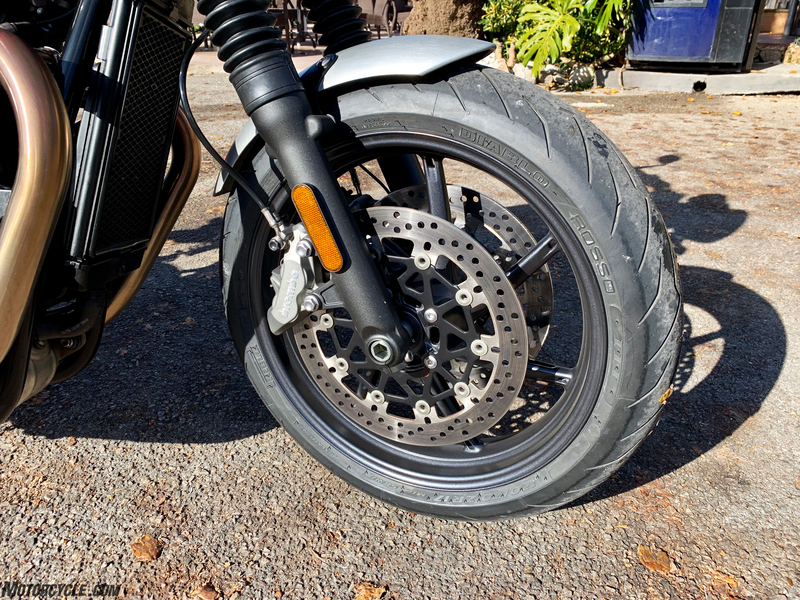 Lowering the rotational inertia makes directional changes easier on a motorcycle, and we typically see advances in it by addressing wheel weight. The Speed Twin is no different. The inertia of the front wheel and and disc assembly was reduced by 28%, while the rear wheel lost 43% (due to the weight being removed from the outside of the rim). We can’t wait to see how this affects handling, particularly side-to-side transitions. With a tubular aluminum handlebar based on the Speed Triple, the rider’s upper body seems to be in a similar position with just enough forward cant to combat the wind blast. 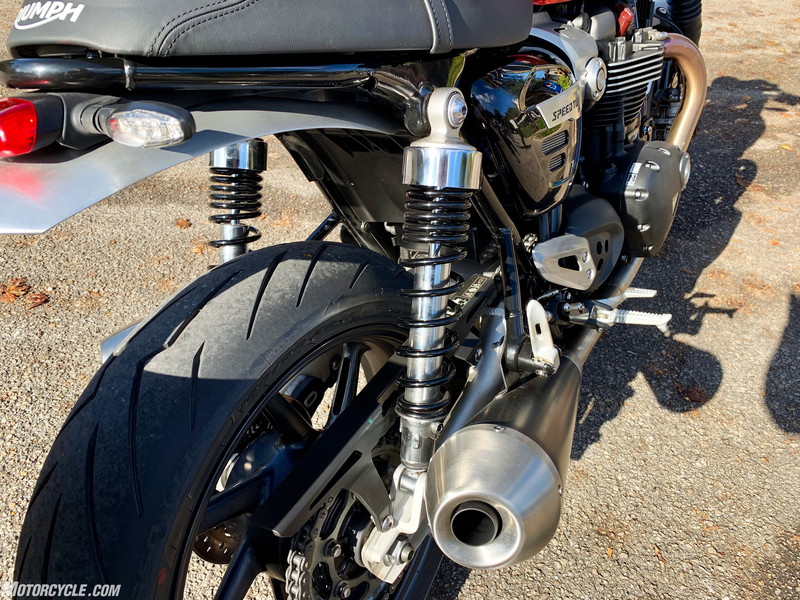 The foot pegs are 38mm forward and 4mm lower for a much less aggressive riding position when compared to the Thruxton. Additionally, the seat features 10mm more padding. You’ll have to wait a few more days for an actual riding impression of these changes. Triumph has announced the Speed Twin will be available in Jet Black, Silver Ice and Storm Grey, or Korosi Red and Storm Grey with the two-tone colors coming at a $500 premium. The Jet Black Speed Twin carries a $12,100 MSRP. 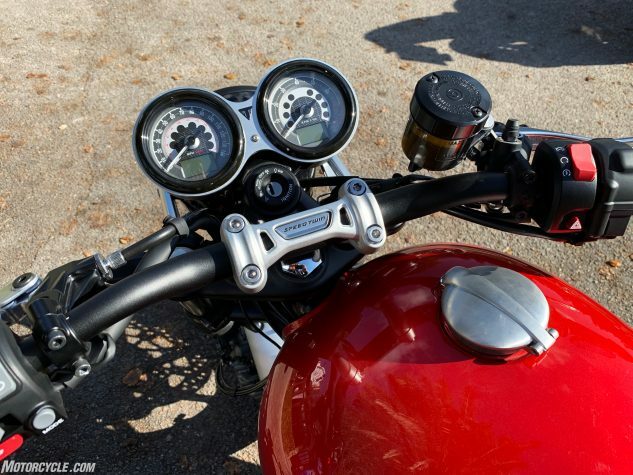 Apparently, weight isn’t the only thing that the Speed Twin has dropped when compared to the $13,000 base model Thruxton. Finally, the 2019 Triumph Speed Twin will be available in the U.S. in mid-March.